It is more critical than ever in our history to hedge against economic collapse, especially this year of 2015 and the autumn of this year. Seven experts from around the world agree with this impending collapse, and they include The Jerome Levy Forecast, John Ing, Bill Fleckenstein, Paul C. Roberts, Phoenix Capital, Gerald Celente and Ron Kirby. You have a once-in-a-lifetime opportunity to profit and survive when a sudden economic collapse arrives in 2015. Great chaos and confusion is going to accompany the crash. There are 3 primary ways you can profit from it. One is investing into gold shares, coins and bullion. The second is investment into silver. The third is that you can diversify a percentage of your holdings into an inverse Exchange Traded Fund (ETF). When the crash occurs it will be too late to invest in the ETF market. The financial sector of the market will be virtually destroyed. Inverse ETFs , gold and silver will skyrocket to highs that you’ve never seen before. You need to know the timing since it’s critical to invest at least 2 weeks prior to the event itself. The shadow government knows that the $18 Trillion in U.S. debt and the 1 Quadrillion in derivatives in the market are not manageable, nor can it ever be repaid. Their only plan is for a crash, to be followed by a devaluation. The end result is a financial tsunami the likes of which you have never seen before. 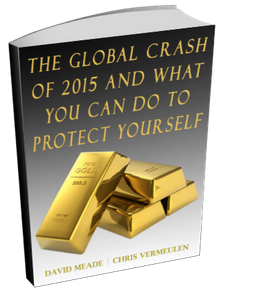 The Global Economic Collapse of 2015 book covers the history you need, the facts you need and a detailed description of the 2015 strategies you must employ. This book provides you with the tools you need, and the precise timing of the engineered crash to occur later this year. The Great Depression of 2015 is going to happen, but you can profit from it. In this book Investigative Journalist David Meade explains how. A chilling look at the facts, graphs and cycles behind America’s next economic collapse. There is a pattern of economic crashes occurring approximately every seven years dating back to the Great Depression. The Great Depression suffered its worst year in 1931, then later we have the Arab Oil Embargo, the S&L crisis, Black Monday, the 1994 Bond Massacre, the 2001 NASDAQ crash, and the 2008 Financial Collapse. Each occurred at the very end of a 7-year economic cycle. There is an additional mystery to this cycle which makes it absolutely extraordinary. This seven year cycle also lines up with the 7 and 49 year cycles of land rest and jubilee debt forgiveness that God commanded the Israelites. This is called the Schmita Cycle. We’ll cover this. It is the “cycle of cycles” that economists have been looking for. We are on the verge of the greatest depression in history, and with it the most opportunity to profit. There is a plan to destroy the US Dollar and not to pay back the 100 Trillion in unfunded liabilities. The elite would prefer to simply transfer their personal holdings to Euros and gold. Their plan is to divest American assets, sell the dollar, renege on all debts and start with a brand new currency. That plan is revealed here. This book will show you the cycles, analyze the inevitable outcome and give you the information you need to profit from the coming economic collapse. Get ready for the most amazing buying opportunity of your lifetime. Gold strategies, Silver strategies, gold stock strategies and much more are covered in this one-of-a-kind manual. I have not found any other books that allow the investor to safely re-balance their portfolio from their home office, without leaving there. It is written as an eBook, for ease of search ability (just enter Ctrl F and you can find any search term or topic you want), and for ease of research ability. I am an Investigative Journalist, a cryptographer and have been employed at the Pentagon and Fortune 500 Companies. I’m the author of close to 10 books. Enjoy this one!